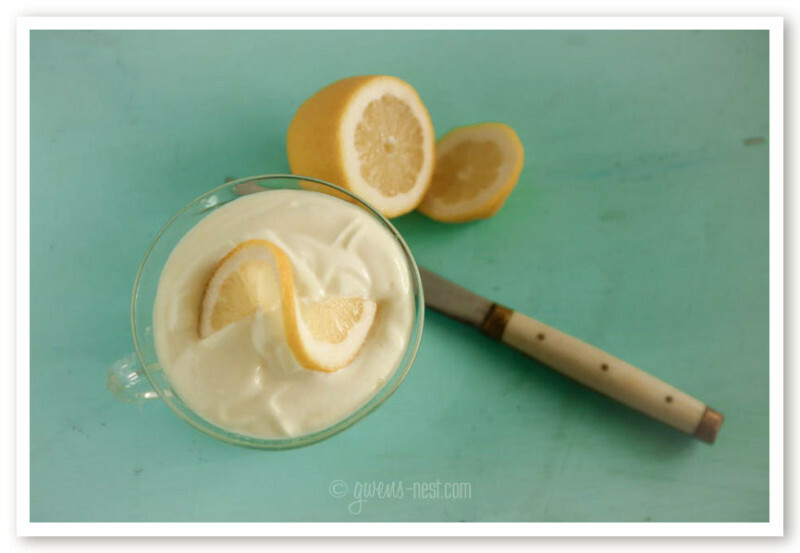 This luscious lemon yogurt recipe is actually the invention of my son. 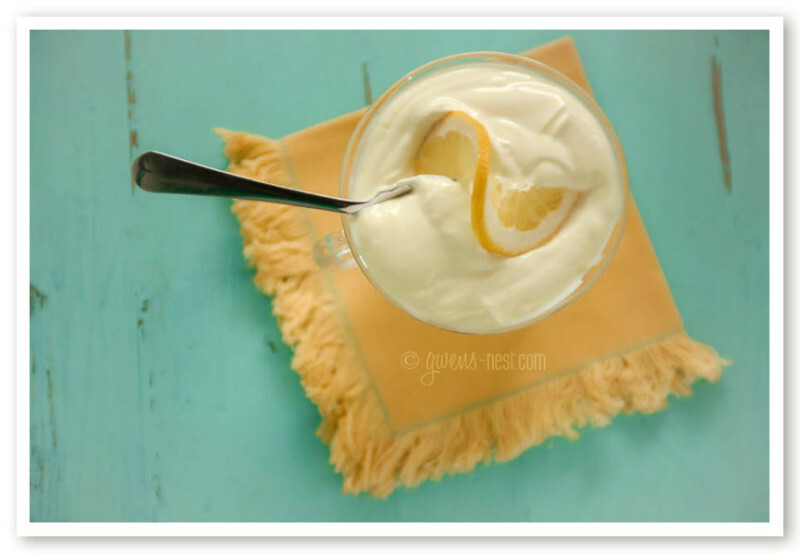 We both LOVE lemon desserts, but who needs a dessert when you can quickly mix up this Luscious Lemon Yogurt! 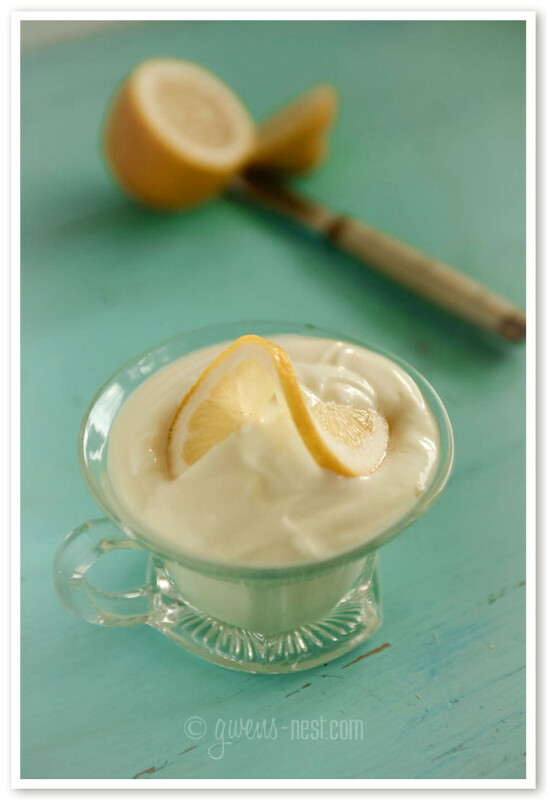 Even if you’re not a big fan of yogurt, you’ll be amazed at the way the zing of the lemon dances with the twang of yogurt…it’s a little party in your mouth! I keep wanting to call this Luscious Lemon Pudding. When you make it, you’ll see why. This is optional, but I love how it boosts the subtle lemony yellow color. PLUS, it’s a fabulous herb for health! I’ve been sort of obsessed with adding it to foods since it helped my kids in their recovery from whooping cough a few years back. 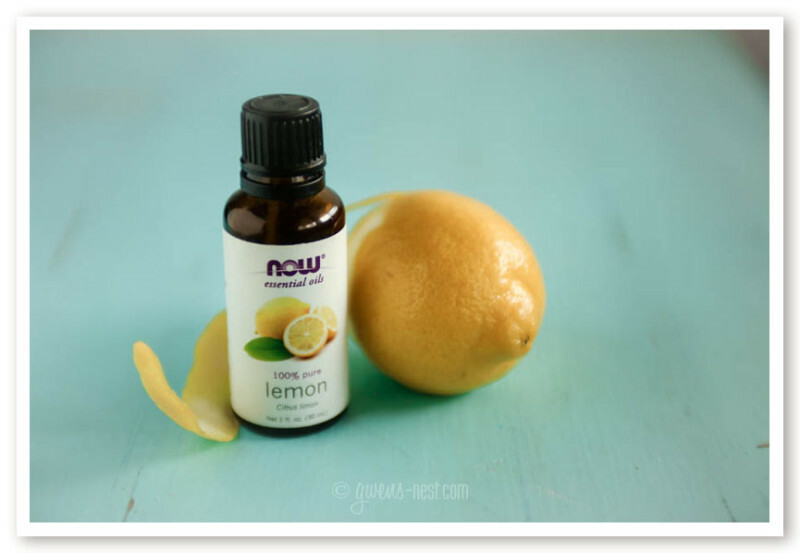 This is my secret weapon to AMAZING flavor…just *one* tiny drop drops an atomic bomb of lemon flavor. Now, I *know* how potent and powerful essential oils are. I get it. I’m not a proponent of using them in water, but so long as the oils are fully dispersed in a recipe, there IS a safe amount of use. I give more info on essential oil safety as flavorings. For sweeteners, I’ve come to love the Trim Healthy Mama Super Sweet Blend (super economical, as you use way less!) and their powdered Gentle Sweet, that measures cup for cup like sugar. To find these great low glycemic sweeteners, check out the Trim Healthy Mama store via my affiliate link. stir them together, and taste. I told you this was easy!!! I always like to add a pinch of salt, and then adjust the sweetness. You can adjust the flavor and sweetness levels to hit all the right notes for you. Your finished product should be perfectly sweet, sour, tangy, tart, and amazingly lusciously lemony! And pudding-ish. If you’re a Trim Healthy Mama like me, then you’re going to LOVE that this is a Fuel Pull option, which means that you can really eat it with anything! I’m telling you…it’s as good or better than a really yummy lemonaid pie. THAT good. And believe it or not, this little treat packs a good protein punch, and is fat and sugar free! Take THAT inferior, sugar laden lemon aid pie. THIS is how I ate my luscious lemon yogurt. As a sauce, over the top of a low carb lemon poppyseed muffin. SUPER YUM. I also have aspirations of freezing this in popsicle molds, and layering it over an almond meal ‘graham cracker’ type crust. 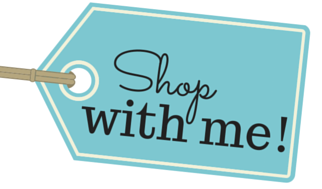 A note on sweeteners: I’ve come to really love the Trim Healthy Mama stevia, Super Sweet Blend, and Gentle Sweet…you can find all of them here at the affiliate link to the Trim Healthy Mama store. And lookie here! NOW you can make it by the quart! This may not be related, but do you do vaccines? I am very thankful to have stumbled upon your blog. I am looking into the “lifestyle” book for my daughter and me. Thank you and God bless you. Mother of 8 homeschooled blessings. 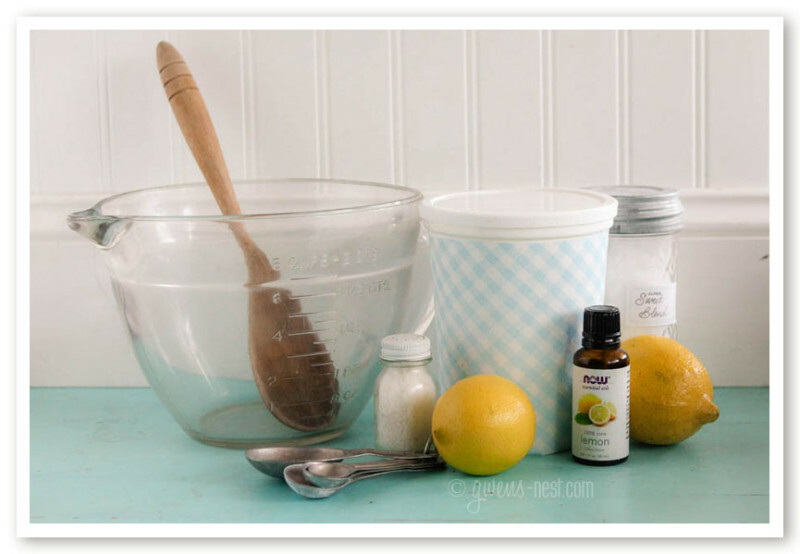 Do you think you could use lemon juice? I rarely buy lemons but I do get the natural lemon juice from Costco. You can. Let me know how it turns out. I really love the real lemon juice, though, as the rind of the lemon sprays the natural oils in with the juice, which adds so much depth to the flavor. 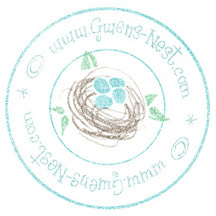 After printing off ALL your THM approved recipes and making a tab in my 3 ring recipe book called ‘Gwen’s Nest’ I tried this recipe as the debutante. Only my tumeric must not have been tumeric…I think it might’ve been closer to cumin or curry! 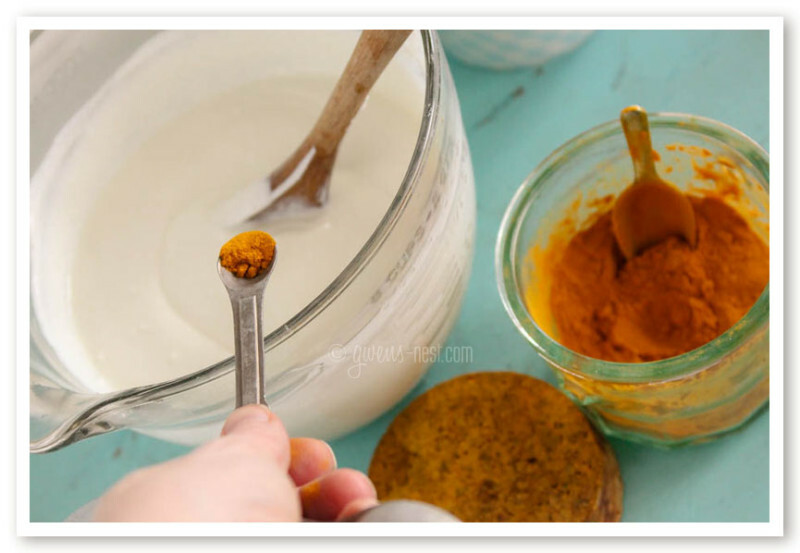 I ended up using almost a teaspoon just to get the color right and then, with tummy rumbling, I took a nice big spoonful anticipating luscious lemon deliciousness…and almost gagged! It was like Gross Indian Curry Lemonade Pie. Not 2 flavors I recommend blending. Apart they are wonderful. Together, gross. Laughing at myself I chucked it out and determined to try, try again. With proper tumeric!! Oh, dear! I use a tiny pinch…not enough to taste it. 🙂 It’s very pale yellow. Oopsie! Hi Gwen! I wanted to add I LOVE your tablecloth and bowl, so pretty! May I ask where those are from? Thanks so much and the “pudding” looks delish! This is a new favorite at the Myers house. 🙂 And I don’t even like lemon. I absolutely love this lemon yogurt. I am glad to be using my turmeric too. I used to add it to rice for color but I am not eating my rice now that I am trying the THM lifestyle. Discovered this today and eating it for a mid morning snack! Yum! I added vanilla and a tiny dash of cinnamon, but I add those to everything! 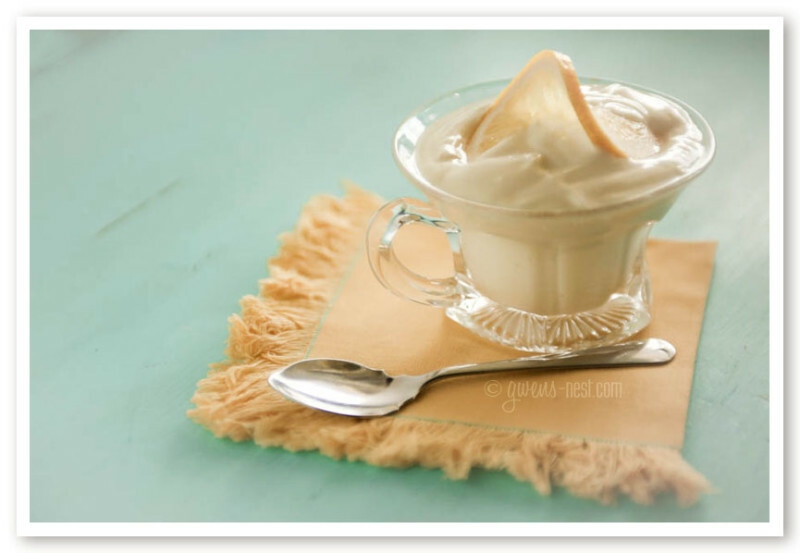 Thanks for this recipe, I missed lemon yogurt! I made this for my family and my parents last night. It was a hit with everyone! That never happens! My mom detests yogurt and my oldest has sensory issues with food. This is amazing! Thanks for sharing. Do you think you could do this with a lime instead of a lemon too. I love lemon and I love lime. Not together but I do love both of them. Just made this for my afternoon snack!! So Good!! Thank you Gwen!! I just made these this morning and couldn’t be more pleasantly surprised at how great they were! Thank you for the great recipe! did you ever try it frozen? how was it. I remember eating frozen lemon icebox pie growing up and loved it. I wonder if this would be similar? I’ve not tried freezing it, but I bet it’d be amazing in an ice cream freezer! Gwen, I keep thinking this would not be a fave when I read about it… but since it keeps coming up I decided I need to read it and try it anyway.. I have to tell you I laughed out loud at the “Hide in the closet” part. I’m looking forward to trying it. I’m out of lemons so will pick some up next time I’m in town! You can use full fat plain yogurt, or low fat plain yogurt. They should have the same amount of carbs. That doesn’t hold true for sweetened brands, but it does for plain/unsweetened (although carb counts will vary from one manufacturer to the next). You are such a blessing, love your site, even though I don’t know how you find the time.. Happy you do.. 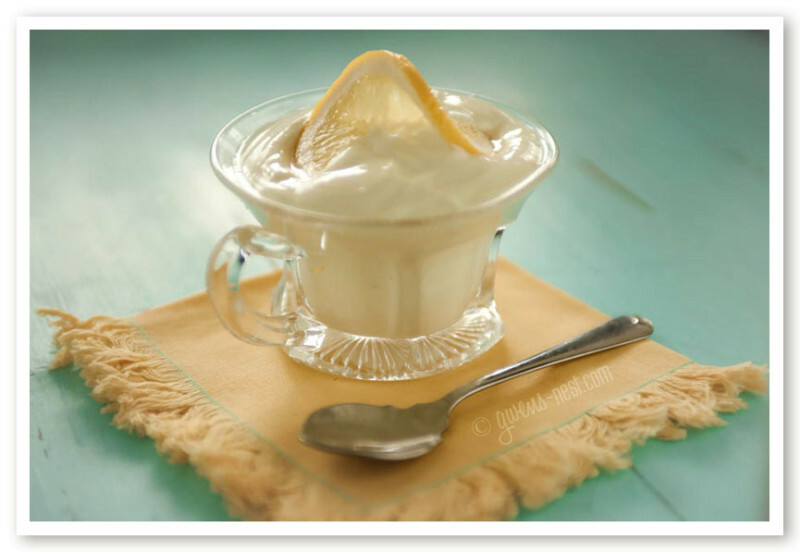 Tried the lemon yogurt, yummy..
Do you have a lemon cheesecake recipe? Sometimes, when I am in town, I drive real fast past the bakery that sells lemom meringue cream pie and the lemon cheesecake! Ha! I LOVE lemon desserts too! I’ll work on the pie and cheesecake. Sounds so yummy! Hi, Gwen! Just wondering- why are low-fat and no-fat products used on thm diet? They have added sugar to make up for the lack of fat, and I have heard that full-fat products are healthier. 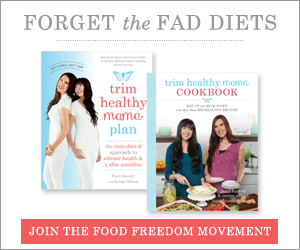 Can full-fat products be successful, as far as losing weight,on the thm diet? Also, how much of the new thm sweetener that thm sells (the Stevia and ethritol? blend) would you use for this recipe? Are there any every day sweeteners that can be used for this recipe? I don’t have any of the special sweeteners yet, and I don’t think regular sugar would be a good choice. You’re right! *Normally* when you buy lower fat yogurt, you are getting lots more sugar to make up for the lack of flavor. However, THM doesn’t recommend using pre-sweetened products, so there is no sugar added at all to the plain 0% Greek yogurt. 🙂 The sugars listed on the nutrition info are simply milk sugars that are present in the milk itself- but in low enough quantity that it doesn’t affect your blood sugar. THM recommends separating healthy fats from healthy carbs to lose weight. Once you’re at goal weight, or if you have kids, they recommend combining fats & carbs (called “crossing over”). So they’re not focused on *only* being low fat or low carb. You get to enjoy both healthy fats & carbs! what about just lemon and yogurt and plain old-fashioned sugar? sometimes “new and improved” is only the former! You’re completely welcome to use any sweetener you’d like. 🙂 Many of my readers and myself are limiting sugar, and prefer stevia, so most of my recipes here will call for it. Hi Gwen! I love your website and your recipes! In this recipe, a cup of non-fat greek yogurt is considered a fuel pull, right? Does it matter how many carbs the yogurt has in it? I’m noticing that different brands on non-fat greek yogurt have varying amounts of carbs. And also, would a cup of the Oikos Triple Zero yogurt also be considered a FP? Thank you!! I do think you want to choose a lower carb yogurt. I can’t remember the rule of thumb on the amount of Triple Zero. I’m thinking that a FP serving is the little single serve container, and not a full cup.